The fertile arc-shaped basin is home to nearly half the country's population, and the river that feeds it provides Egypt with 90 per cent of its water needs. But climbing temperatures and drought are drying up the mighty Nile -- a problem compounded by rising seas and soil salinization, experts and farmers say. Combined, they could jeopardise crops in the Arab world's most populous country, where the food needs of its 98 million residents are only expected to increase. "The Nile is shrinking. The water doesn't reach us anymore," says Talaat al-Sisi, a farmer who has grown wheat, corn and other crops for 30 years in the southern Delta governorate of Menoufia. "We've been forced to tap into the groundwater and we've stopped growing rice," a cereal known for its greedy water consumption, he adds. By 2050, the region could lose up to 15 per cent of its key agricultural land due to salinization, according to a 2016 study published by Egyptian economists. The yield of tomato crops could drop by 50 per cent, the study said, with staple cereals like wheat and rice falling 18 and 11 per cent respectively. In Kafr al-Dawar in the delta's north, Egypt's irrigation ministry and the United Nations are working on eco-friendly techniques like solar-powered watering that experts say emit less greenhouse gases and could help improve crop yields. Sayed Soliman, eyes bright and cane in hand, runs a group of about 100 farmers who work a plot of more than 100 hectares (around 250 acres). The seasoned farmer is delighted. He can now power the pumps that water his field without relying on Egypt's faulty electricity grid and expensive fossil fuels like diesel that are responsible for climate change. Diesel-powered generators are now only used "when necessary", he says, such as after sunset. 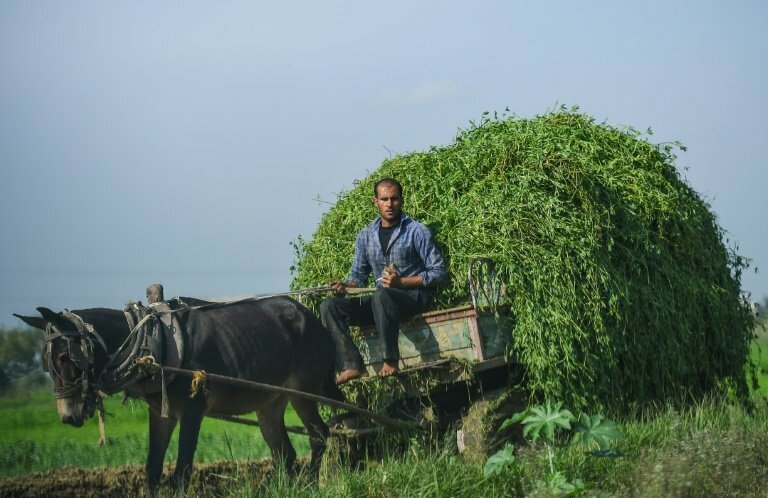 "One of the priorities is innovation... so that Egypt can make the most of its water," says Hussein Gadain, the UN's Food and Agriculture Organization (FAO) representative in Egypt. "The delta plays an important role in the country's food security." Ibrahim Mahmoud, head of the irrigation ministry's development projects, said plans were in place to modernise watering systems across the country by 2050. The strategy, he says, is intended to improve farmers' "environmental conditions, standards of living and productivity". AFP's visit to Kafr al-Dawar was closely supervised by the ministry. In front of officials, farmers stuck to well-worn talking points about the delta's bounty but politely skirted questions on water scarcity. Sisi has made the Nile's water a "life or death issue" for Egypt, particularly in the framework of negotiations with neighbouring Sudan, as well as Ethiopia. Cairo fears Addis Ababa's controversial Grand Renaissance Dam will bring consequences downstream. For water management consultant Dalia Gouda, Egypt currently has two priorities when it comes to combatting its water scarcity dilemma: tackling overpopulation and defending the country's interests against Ethiopia's dam. "There are many interesting projects under way to improve water efficiency," says Gouda. "Although they are not necessarily designed to combat the effects of climate change, they can only prepare the authorities to deal with them."